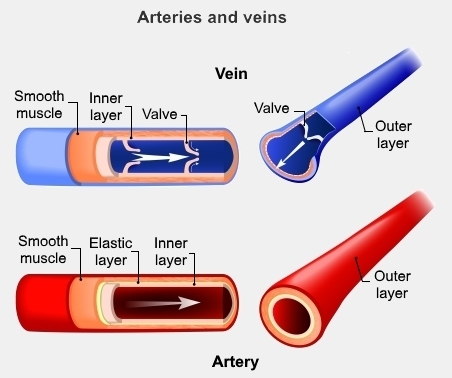 Blood vessels consist of arteries, veins and capillaries. Most arteries carry blood away from your heart and deliver oxygen to the tissues around your body. Muscles within the artery walls relax and constrict to allow more, or less, blood to flow. See Problems with arteries to learn about problems that can happen with arteries. Most veins return blood back to your heart. Your veins also have muscles but less muscles than your arteries. The muscles within your veins allow them to get larger or smaller in response to heat, cold or injury. One-way valves inside your veins stop your blood from flowing backwards. Veins you can see under your skin are called superficial veins. Blood in your superficial veins drains into veins that are deep within your body (called deep veins). Most of your blood returns to your heart through your deep veins. Muscles around the deep veins in your legs pump blood back towards your heart when you walk or run. Regular exercise helps maintain healthy blood circulation in your blood vessels. See Problems with veins to learn about problems that can happen with veins. Capillaries are tiny blood vessels that connect the arteries and veins in your tissues. They deliver the oxygen and nutrients that make your body function. They also remove carbon dioxide and other waste products, which are excreted (removed) or metabolised (recycled) by organs such as your liver, lungs, kidneys and spleen.